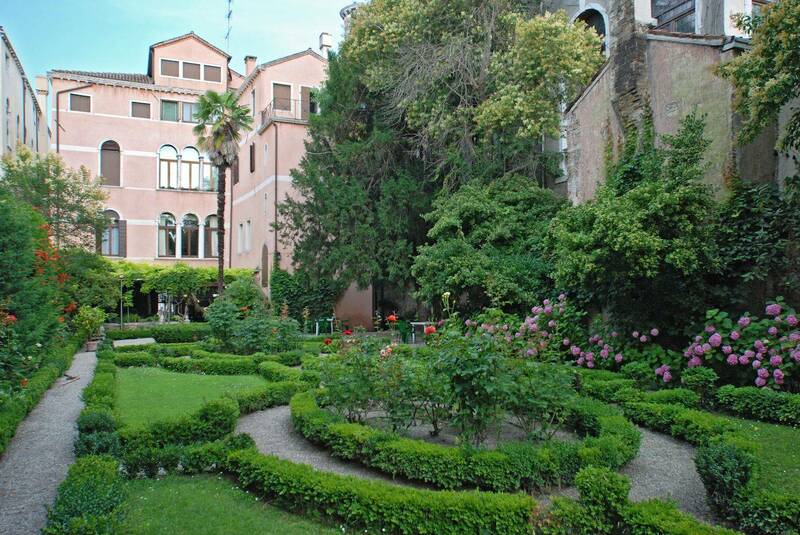 We named it Rezzonico Garden as it is found right next to the 18th Century Art Museum of Cà Rezzonico and in front of Palazzo Grassi, the other landmark owned by François Pinault house of his prestigious contemporary art collection. 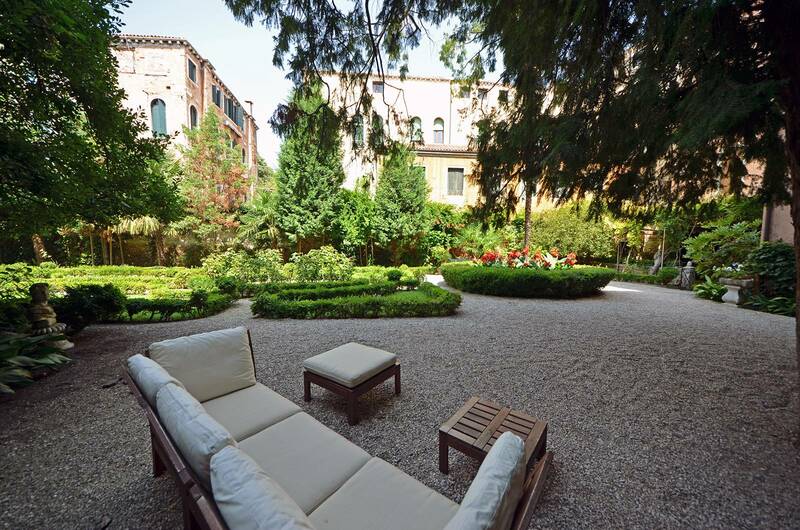 Another plus of the Rezzonico Garden is the exclusive water door accessible directly from the Grand Canal: if you land at Venice Airport and book with us a private water taxi, in only 30 minutes you will be relaxing on the sofa at home. 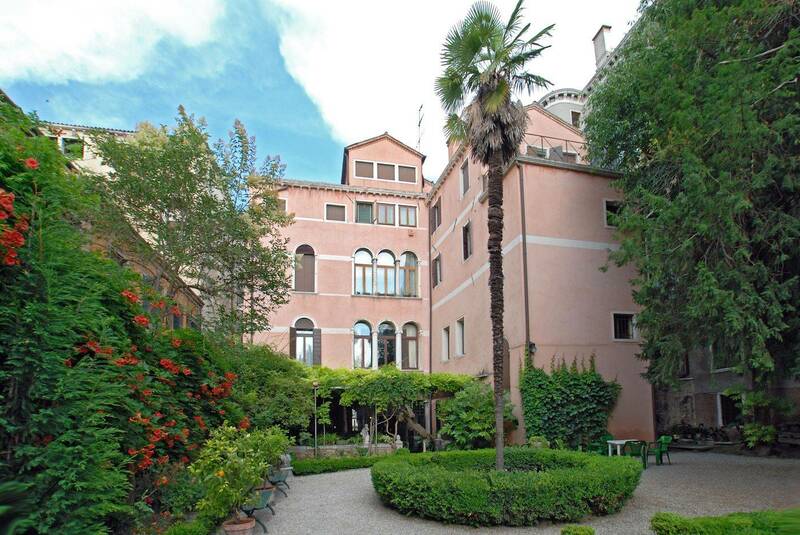 Please be aware that the guests of this apartment can access the palace directly from the Grand Canal water entrance door during the caretaker working hours (monday to friday from 8am to 6pm) and only upon his availability during week-ends and nights, please enquire for further information. 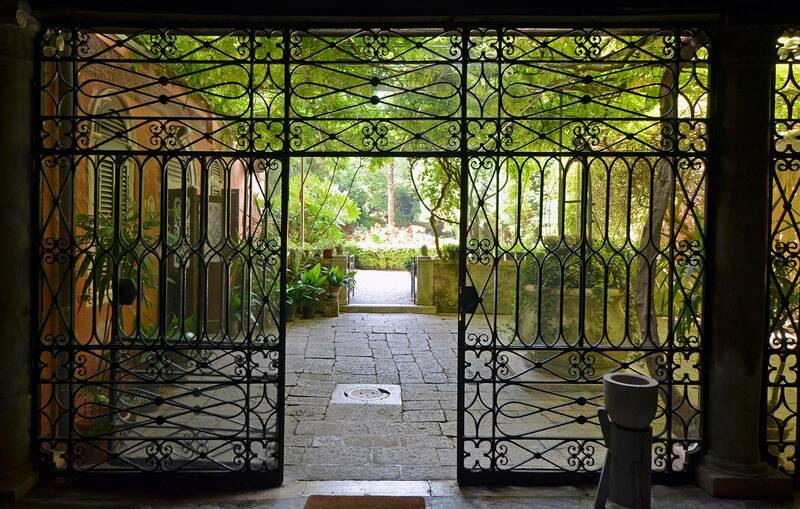 The house is located at the first floor above the garden, laid out on roughly 200 square meters and composed of a huge living and dining area inundated with light through the beautiful "Trifora" (arched windows), a fully fitted kitchen, two bathrooms and three bedrooms. The master bedroom is particularly spacious, has a large window with view on the garden and gallery reachable through a nice wooden stairway used as an office. 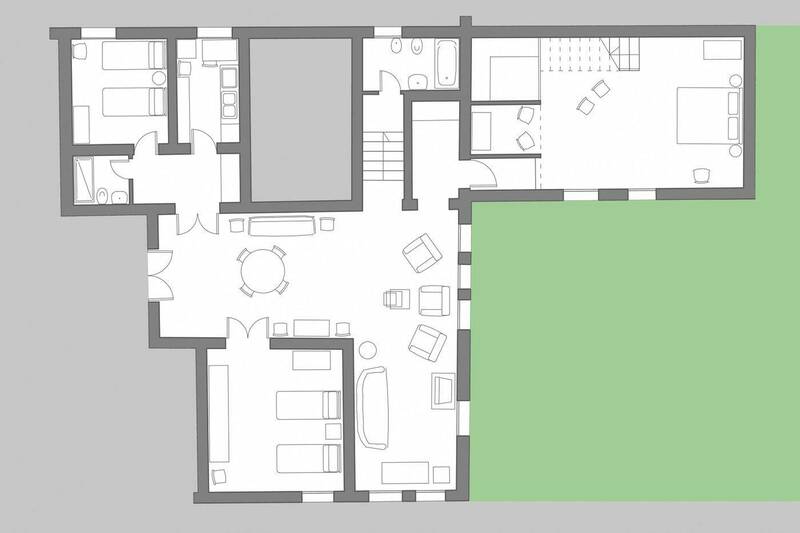 The other two bedrooms can be either twin or double (please specify how you want them when enquiring) and all of them benefit from integral privacy being located on different sides of the apartment. 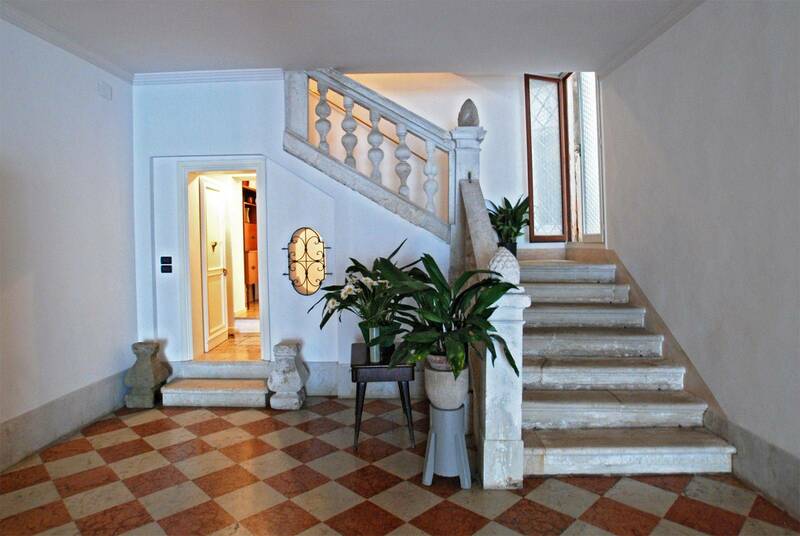 The entire apartment features high ceilings, terrazzo Veneziano flooring and classic style furniture. In particular the living room is adorable in the afternoon when the sun shines on the garden and flood with light the sitting room where you can enjoy an exclusive tea break with garden view. Every room has air conditioning and there is Wi-Fi internet connection. 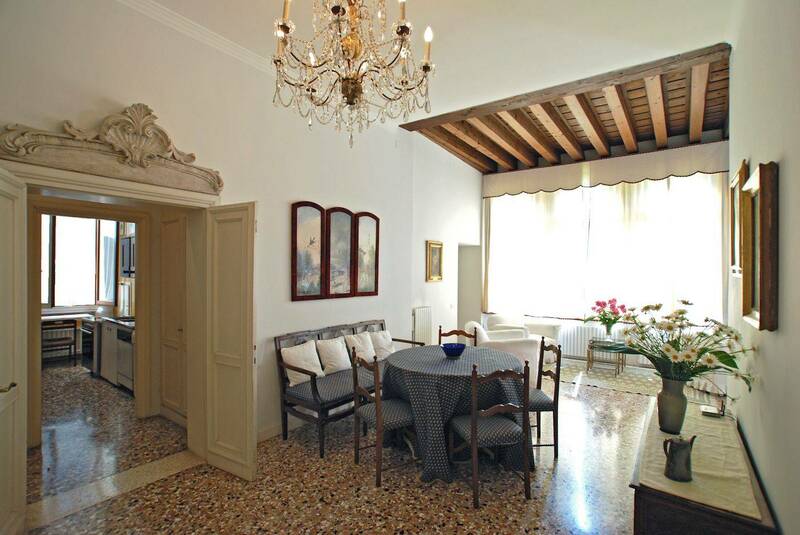 If your group need more rooms, at the ground floor of this Palazzo are available other two smaller apartments: the former is 70 square meters, composed of an elegant living room with Grand Canal view and a double pull-out sofa, one double bedroom, one bathroom, a large kitchen with table for four people; the latter is a studio apartment with one double or two single beds (on request), a bathroom and a basic kitchen. 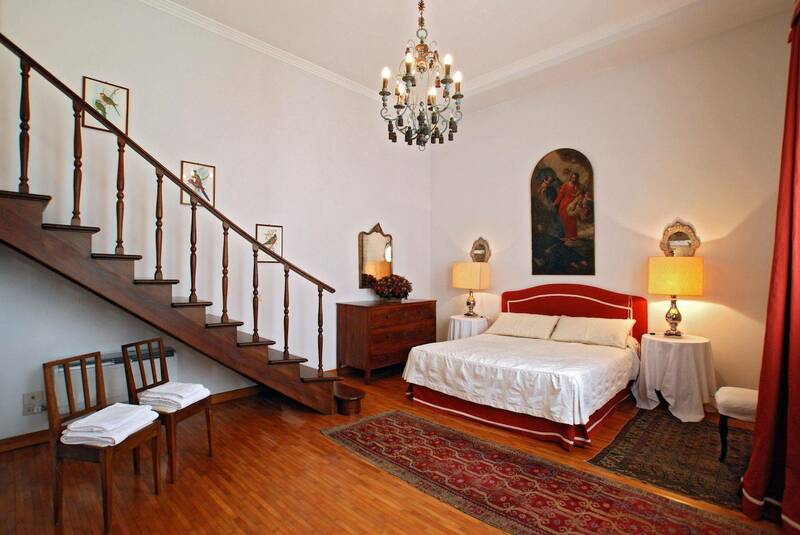 In total the Rezzonico Palace give comfortably hospitality to 12 people. We had a really lovely holiday. The apartment was well appointed and had a wonderful garden. It was ideally placed to explore Venice, the vaparetto stop being very close. In addition there are many lovely restaurants close by and also the Punto supermarket, bakeries and the fruit & vegetable barge. An excellent location. 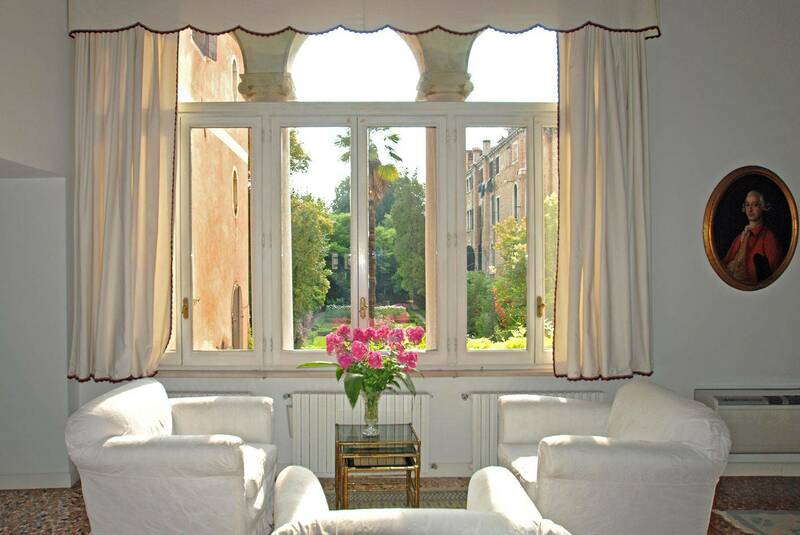 We just returned from 10 wonderful days in beautiful Venice staying at the Rezzonico Garden apartment. This apartment is large, beautiful, comfortable, in a great location, and has a gorgeous view overlooking a very special garden with flowers, birds, turtles, and a black cat. I really can't say enough good things about it to describe how much we enjoyed our stay here! We were traveling as a multi-generational family: my 86-year-old mother, my husband and myself, and our 19-year-old daughter. My mother had some difficulty getting up the stairs to the apartment, which is one floor up, but she managed. The apartment is at the very end of a small street, with the entry door right by the Grand Canal, so it was always a lovely and private place to come home to. I dealt with Daniela online for all the arrangements, and she was always very responsive and helpful. 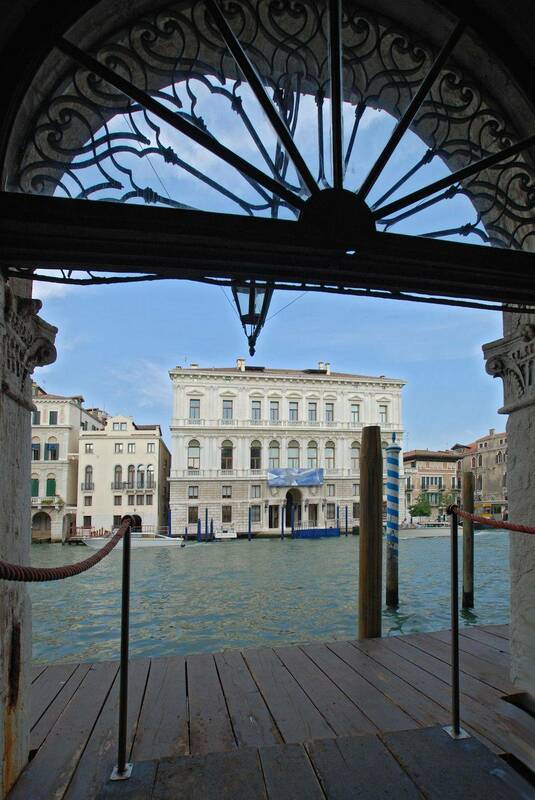 We arranged through her to take the water taxi to the apartment upon arrival at the airport, and even though it was a Saturday, we were dropped off right at the entrance to the palazzo, which was absolutely wonderful. If you can afford the water taxi, by all means, it is so worth it (especially with seniors and/or children)! It's quick and a lot of fun. Enrico from Truly Venice met us at the apartment, and he was also very nice and very helpful, telling us about grocery shopping and restaurants to try. The apartment is very near Campo San Barnaba, which is a lovely home base with several good restaurants (don't miss Oniga), an interesting exhibition of Leonardo da Vinci inventions in the church, and several great shops, including Signor Blum with clever 3-D painted wooden puzzles of Venetian buildings. 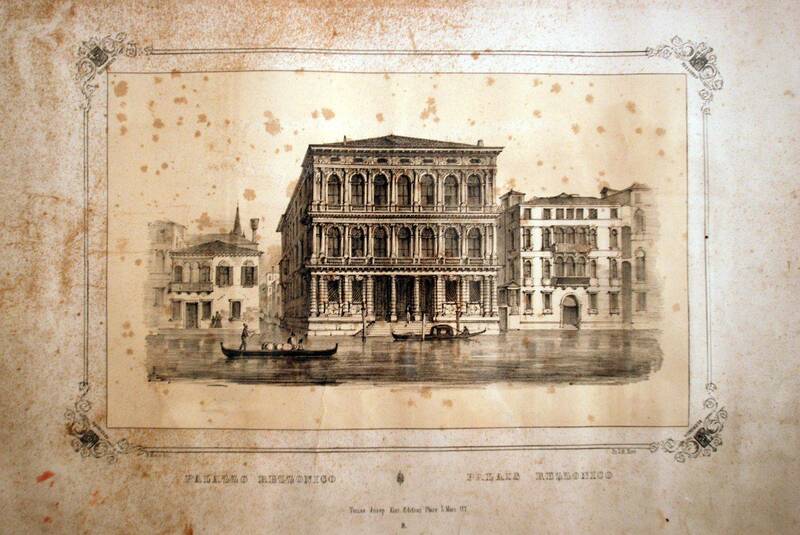 The gorgeous Ca' Rezzonico museum is right next door, as well as the vaporetto stop of the same name. 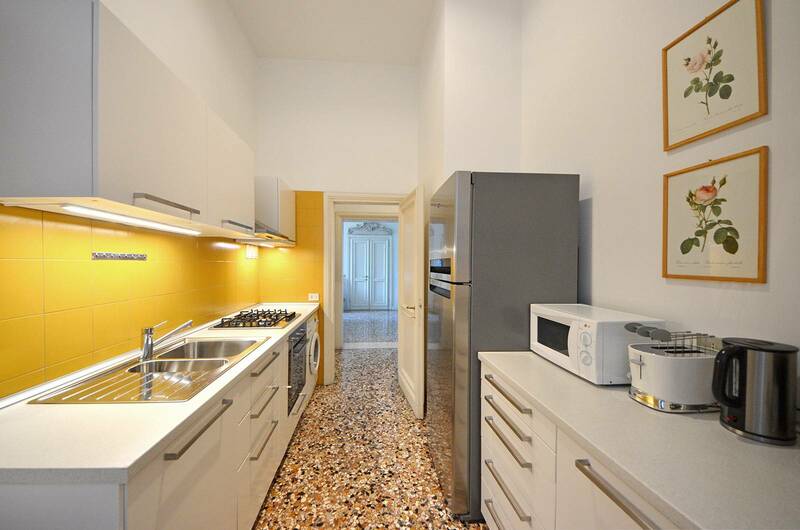 This makes the apartment a very easy and central location from which to get around to other areas of Venice. 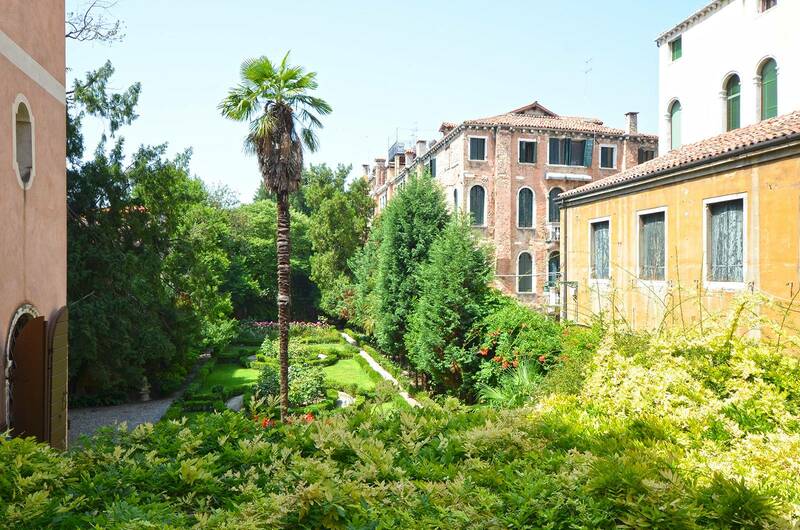 It is located in Dorsoduro, which is much less touristy than other areas of Venice. 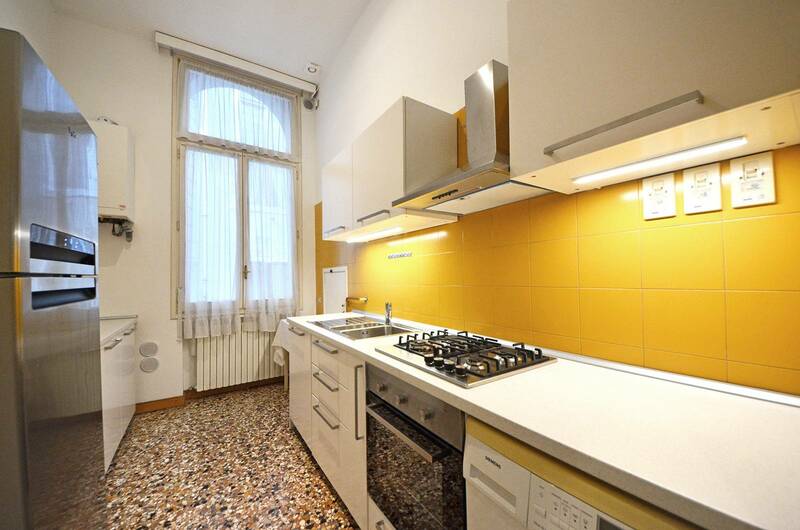 The apartment has a serviceable kitchen with plenty of dishes, utensils, and pans, where we fixed breakfast daily and cooked dinner several evenings (you can get fresh pasta at the grocery). The bathrooms are OK: the one near the master bedroom is up a flight of about 6 steps, and did not seem to have hot water the entire time we were there. 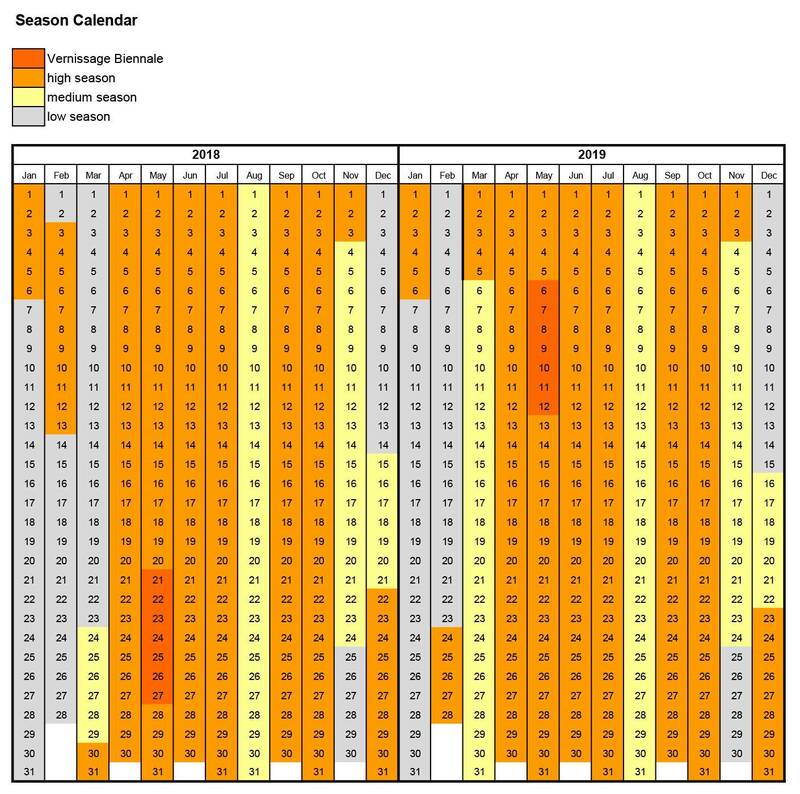 I did not consider this a major problem - it's Italy, things don't always work perfectly! It wasn't worth complaining about. Since the only shower is in the other, smaller bathroom, we all just used that one to shower. The dining and living room are both very pleasant places to sit and relax, and gaze out at the beautiful garden below. 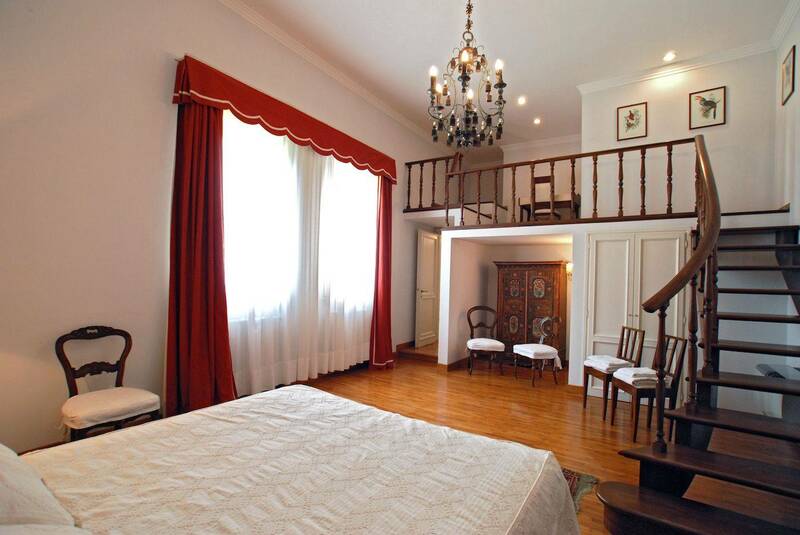 The master bedroom, very large, also overlooks the garden. The apartment is nicely furnished and decorated. It feels like a real home. We loved our stay at the Rezzonico Palace and highly recommend both it and Truly Venice. We would not hesitate to rent from them again in the future. 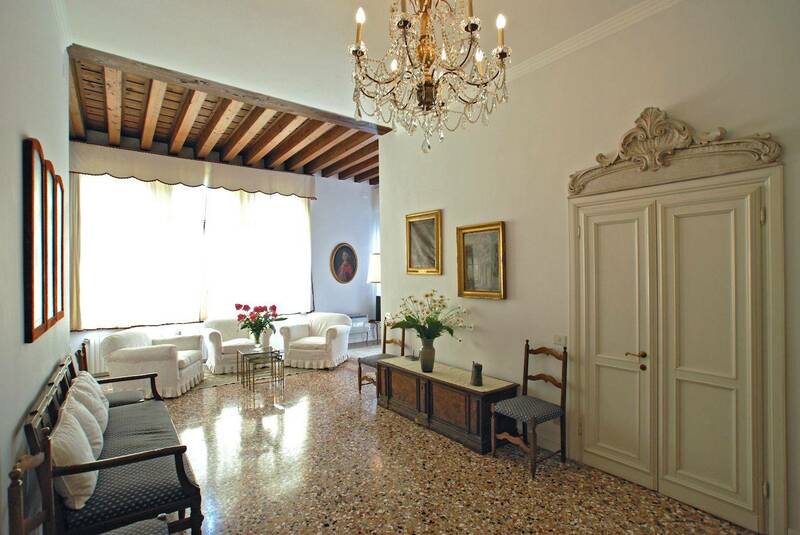 This Palazzo set on the Grand Canal was a real find, spacious, full of light and styled in the Venetian manner. 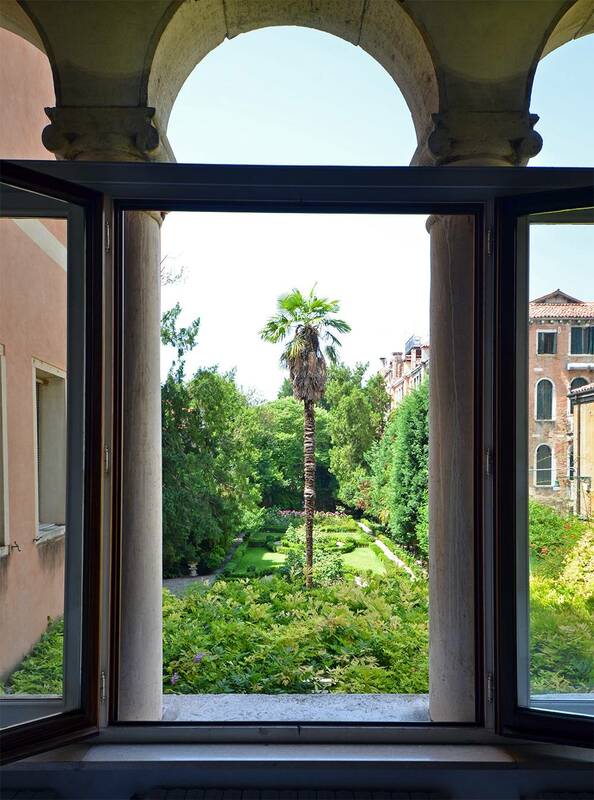 Overlooking a beautiful lush garden where you can have a drink or read. 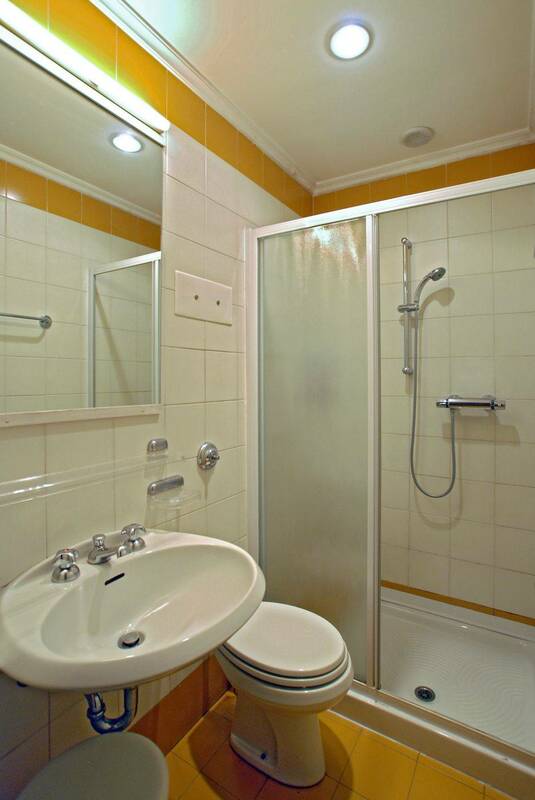 The apartment is well equipped if you want to cook and if you want to eat out there are many good restaurants near by. The agents TRULY VENICE were great from taking the booking to meeting us at the apartment. Do go while you can it's PERFECTO!! 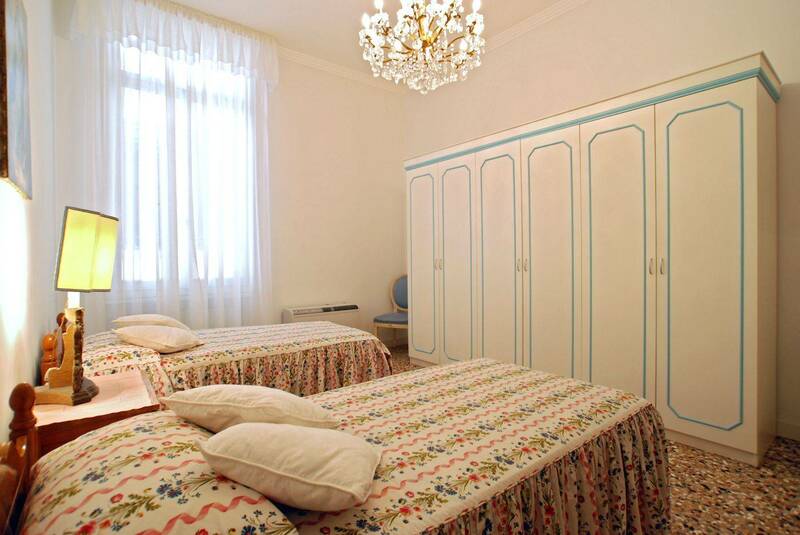 We were lucky enough to stay at Rezzonico for 2 weeks at the beginning of June. The apartment is enormous and perfectly laid out for privacy as well as family time - we were travelling with my parents and our 6-year-old son. There is a fantastic supermarket around the corner and there were often days where we didn't use the vaporetto at all as everything we wanted was within easy walking distance. 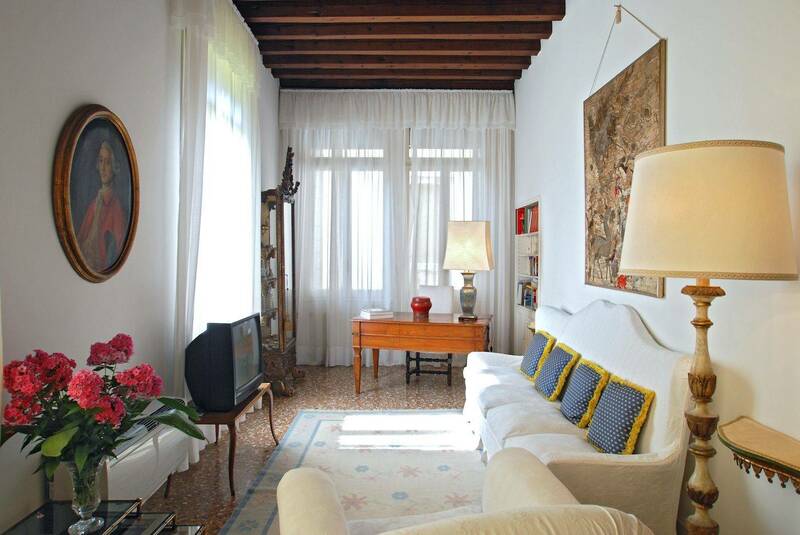 The apartment is not so fancy-pants as to make you uncomfortable curling up on the couch with a good book, but still unique enough and old and glamorous enough to make you feel as if you are living like a Venetian! 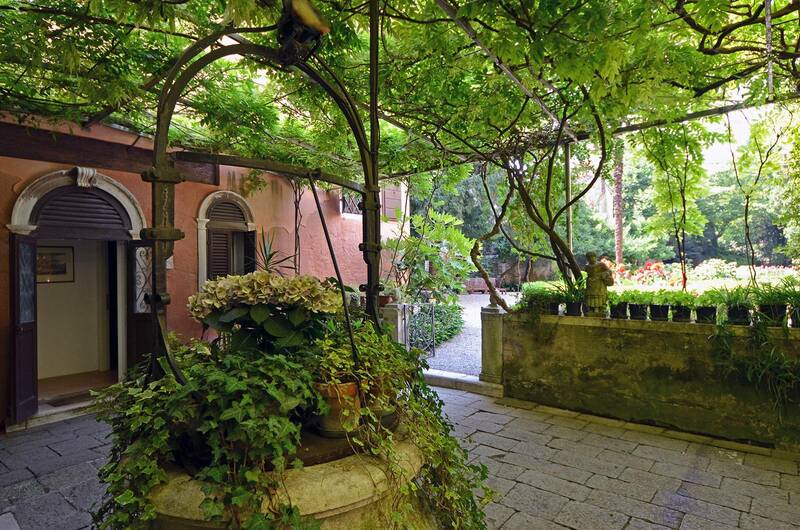 The garden is magnificent, and Fernando-the-caretaker was always helpful and welcoming. And there are tiny turtles in the garden!! I cannot recommend this place enough, although I don't want to - I feel like we owned a little bit of Venice while we stayed there, and don't want to share it! Book it now!!! We were welcomed by a representative of Truly Venice and all the amenities pointed out. It was a great help to have three sets of keys so our group could come and go from the apartment independently. 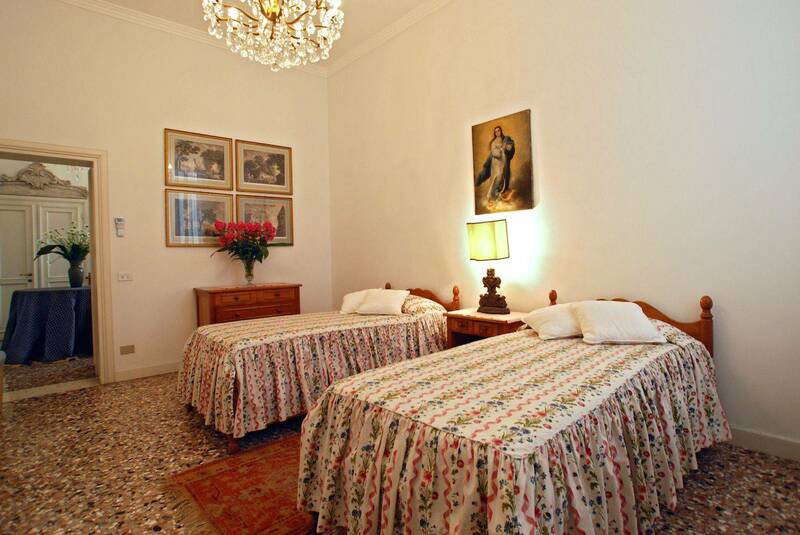 The accommodation was superb, particularly the main living room with the large windows overlooking the beautiful garden, and the two main bedrooms. 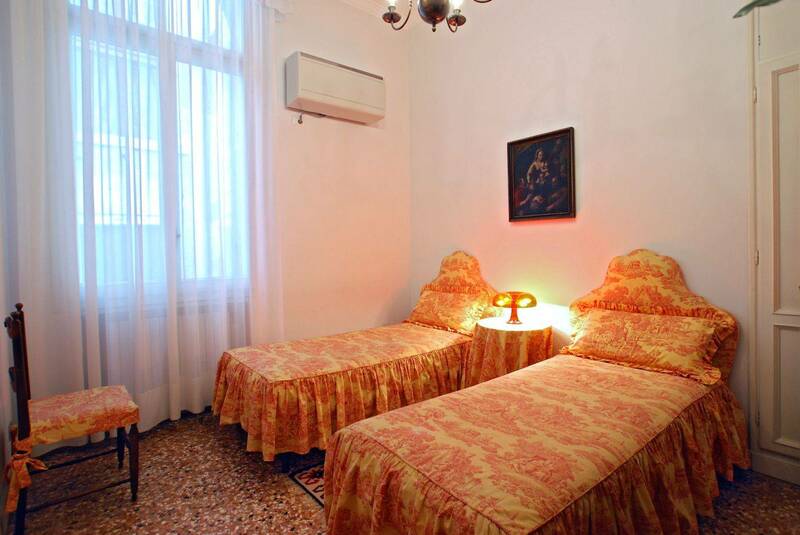 Its location was perfect near to a vaporetto stop and to the main tourist attractions and yet peaceful and with good restaurants. The garden was a huge bonus as a place to sit in and also giving that apartment a light, airy and private feel as not directly overlooked by other buildings. We felt we could have easily stayed for longer! We were 6 adults: 2 parents and their grown-up sons and partners. We were met punctually and warmly, all the facilities were shown to us. The flat was bigger than we expected, so we were all accommodated very comfortably. The location couldn't be better - by the Grand Canal, but not right on it which might be noisy. The garden is an oasis of calm. Lots of good restaurants nearby. We all loved it and had a great holiday together. 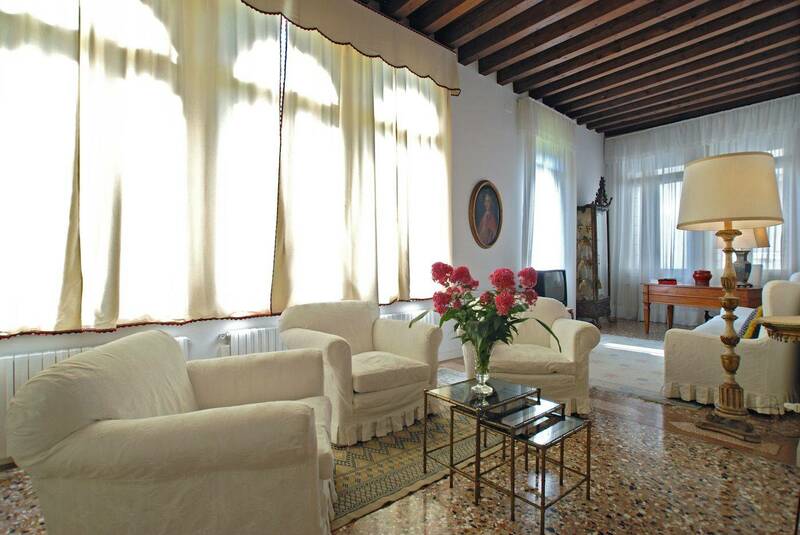 Truly Venice provided wonderful service both in the booking of the apartment and in the care we received whilst in Venice. The flat was all it was promised to be on the website and very clean and well maintained. 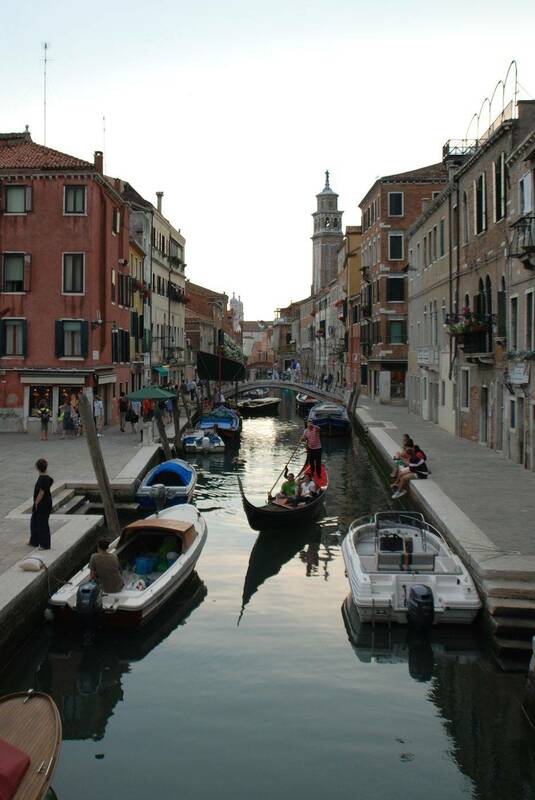 The location is extremely good in our opinion, Dorsoduro being our favourite district in Venice. The access to the garden was a huge bonus and the views over the garden from the flat were absolutely lovely. Highly recommended. 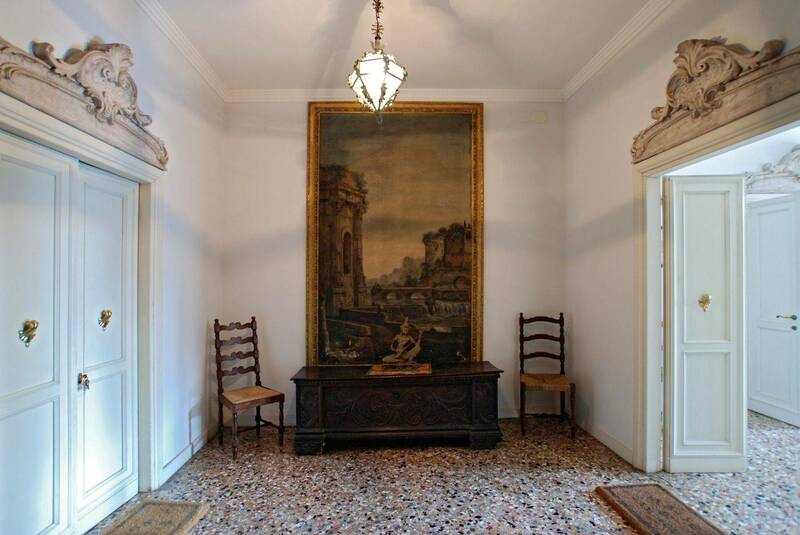 We found the apartment which is part of the Rezzonico Garden ideally situated on the Grand Canal and within easy walking distance for both the Rialto Bridge area and San Marco. 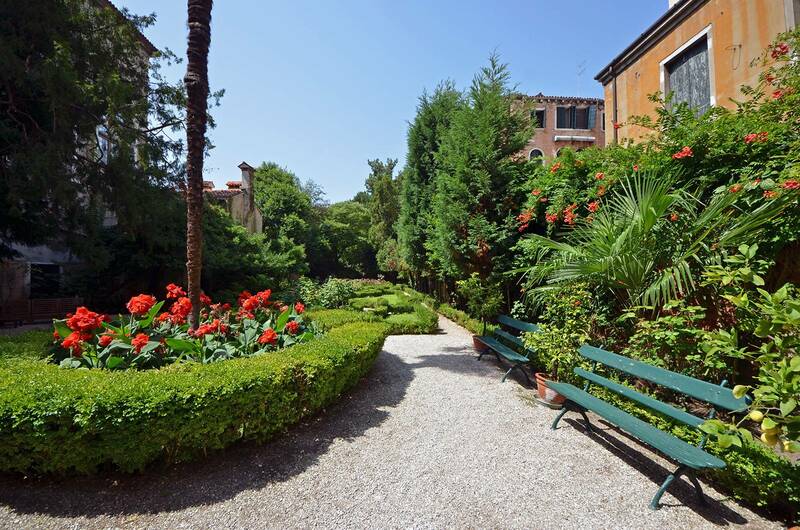 The apartment also has the advantage of a pleasant garden. As a party of Grandparents, Parents and Grandchild it suited us very well with plenty of restaurants close by.